As the temperatures warm, people spend more time outdoors. Subsequently, dense neighborhoods like Over-the-Rhine, with its narrow alleys and mixed incomes, become prevalent spots for public urination and litter. Spring in Our Steps submitted a request for response from the City of Cincinnati Livable Communities Committee, and received prompt response and follow up from Beverly Hardy, Manager of Office of Councilmember Yvette Simpson. Both Cincinnati Police and the Cincinnati Recreation Commission see improvements to Ziegler Park as a priority, in order to discourage long-term loitering and litter issues. As for Goetz Alley, we are awaiting response from Miss Hardy about Public Services administering any street or alley cleanings. Recreation will be taking the following steps in an effort to make the Ziegler Park area more inviting. These action steps are in response to concerns raised by the Cincinnati Police Department during an on site meeting with the Director of Recreation in addition to those concerns received by your office. At this time a restroom unit has been ordered and the benches have been removed. I will provide an update as progress occurs. We are pleased with this prompt and thorough response, and look forward to working with these city departments on future enhancements to our alleys and surrounding areas. EDITOR’S NOTE: The request for response that Spring in Our Steps submitted solely addressed concerns with public urination in Goetz Alley, and litter issues in Ziegler Park and abroad. This was not a statement to show fear or prejudice of another ethnicity. The facts are that public urination and litter are pressing issues in this pocket of Over-the-Rhine. I live along a street with homeowners, college students, Housing Choice Voucher recipients, and regular renters. Thus, there would be no reason for me to display prejudice toward a specific group, in this situation. Parks and recreation areas are established for use by all. Alleys are public spaces meant for use by all. Litter and public urination deter some users from taking advantage of these assets. These users range from families to new residents to women walking alone. It’s been proven that litter and public urination issues deter investment in neighborhoods, and lead to further disinvestment. I walk through/past this park almost every day. It’s never been the cleanest certainly, but I’ve also never seen a park that is so consistently full of people. If there’s a time of day that people aren’t having cookouts on that one little grill, I have not witnessed it. I mean seriously, that whole pavilion has no grass for at least ten feet around it because it’s such a popular hangout. As the weather’s been getting nicer, I’ve easily seen more than 150 people at once in that little park and on the courts across the street. …so it’s not totally clear to me what Mr. Pacella means when he says the City is working to make the park ‘more inviting’. Seems like people like it just fine the way it is! Except I do know exactly what he’s talking about. I only wish I were naive enough not to. 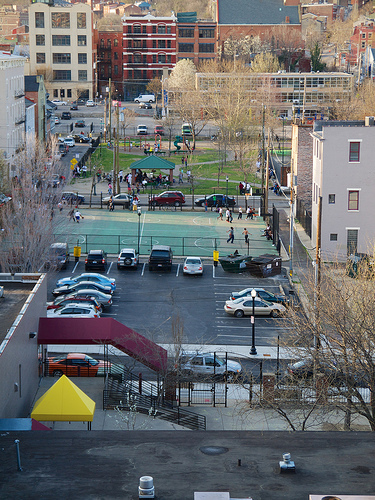 Everyone who hangs out in that park is poor and black and that makes it a less ‘welcoming’ place for white people with money(who are increasingly invested in OTR) to linger. I’ve never personally spent time in the park, only passed through it, primarily because it’s full of people who I don’t have much in common with. Mind though, I do certainly enjoy sometimes on a nice day just being in the company of so many people as I pass through a grillout and a basketball game or whatever else is going on. The park is consistently the busiest place I see day to day and it’s nice to be reminded that I’m in a city….this is why I go to NYC a couple times a year. I want to be near so many people just to get a high off the buzz of humanity. But back to the park! For me personally, as a young white guy with more money than he probably ought to have, it just doesn’t feel like my park. And that’s fine. I don’t feel unwelcome. I’d prefer there were less litter, and I’m sure everyone would be better off if there were a little less of that going on…but removing benches and a sitting wall?? That’s just explicitly trying to get rid of the people themselves! Other parts of the city are trying to get more benches and seating to attract people! Fountain square spends millions on bringing in bands and even selling drinks to do just that. Clifton is glowing with pride over their new little pocket square on Ludlow. What could a defensible justification possibly be for a reversal of the general pro-pedestrian, pro-community-park policy in this case? We learned a lot as planners and citizens from ‘Death and Life’ apparently but for when people of color are doing the sitting and watching(and perhaps littering)..? I seriously don’t mean to point the racism/classism finger-of-blame at anyone without knowing more, and most certainly not at Christian, but I can’t think of another reason for removing benches or other seating from a very popular park. I just cannot fathom it. If anything, there aren’t enough places to sit! Thanks a bunch for your reply. I agree with you that it’s quite different to see a part used so fully. The grill is used almost daily. It’s great to see so many people enjoy the park. However, as you mentioned, you don’t feel like it’s your park. When it’s very apparently that Woodward to Yukon and East 13th are used as placed to sell drugs, it’s not going to feel like your park. Open containers often make their way out of the Ziegler Park area too. During an era in which we seek equal enforcement of the law, this should be no exception. However, I’d like to return to the two specific issues I cited in the first place–daily litter issues and public urination. In the case of public urination, it’s the by product of having no bathroom facilities in or around the park. I specifically requested that there be a restroom facility placed in the park, so that public urination would be enforceable, and the stench wouldn’t waft out of the alley. In the case of litter, it’s been very apparent that garbage facilities aren’t being used properly or at all. I did not survey how many trash facilities are in the park, but I mentioned that litter is a big problem. Park rules are established for a reason, and we shouldn’t skirt around those guidelines in order to tip-toe around an issue that includes a specific demographic. So, to clarify, I never requested that benches or sitting walls be removed. Honestly, I didn’t even think that I would receive a response. However, I feel strongly that there should or should have been an opportunity for public input. This reached the Spring in Our Steps email box as a big surprise. I was just pleased that it was being addressed, but posted it without much comment, so that public discussion on the blog and the Facebook page would commence. I emailed the President of the Over-the-Rhine Community Council, requesting that this be included on the May agenda, but it seems he didn’t view it. The Secretary of OTRCC already sent out the meeting agenda. But I will certainly try again, because I do not feel that executive decisions about the park design should take place without feedback. I’ll ask Peter about including it in the agenda this month or next. I’m sure youll get a response soon but he’s right here in the same room at the moment. Im at a presentation on parking plans. Nate nailed it. So what is loitering anyway? People in extended conversation in a public park? Have you lived in any large cities here in the states or abroad? Are you the hall monitor lol ? People “loiter” all the time. Sounds like you feel threatened Christian…… Learn to feel comfortable with yourself & the world outside of your cultural mores. It’s a big world out there – go integrate yourself. Thanks for your reply. I invite you to read my response to Nate’s post. This was not a complaint against a specific group or demographic, but specifically requested action upon public urination issues and rampant litter. I only used the term “long-term loiterers”, as the lack of bathroom facilities do not match well with use of the park for hours daily, nor do trash facilities that may or may not be services once per week. It’s certainly a larger issue that should be discussed in a public forum, such is my mention in Nate’s response about having contacted OTRCC about inclusion on the May agenda. Please take a look at my living situation, as well as the Nate’s mention of us as fellow urban planners. I am certainly not threatened, and I hope that you do not use backhanded remarks toward someone you don’t know. But certainly, any time a social issue is mentioned on a blog, discussion forum, or otherwise, I will and should expect some brash forms of feedback. After all, there’s no way I could expect most of our readers to know my intimate choices about where I seek residence, leisure, work, or folly. I hope that you will continue to follow us in the future, and look forward to your feedback, when I hear back from OTRCC about inclusion on the May agenda. I just stumbled on this website and I do not know any of the parties that have responded but I have, for years, been complaining about Goetz and Bland Alleys and have actually filed suit against the city over them and plan to do it again when I get the time. I have to agree that Nate Wessel has indeed nailed it. I don’t understand the paranoia that Mr. Huelsman exhibits. To ignore the race and/or wealth levels of the park users is naive at best. I had once installed a urinal in Goetz Alley some years ago only to have, according to a local observer, the urinal knocked from the wall by one of Cincinnati’s Finest because he was pissed that the locals used it. I would like to get together with any who are interested in solving this problem. The biggest problem seems to be the city administration, which is reluctant to do anything. When they do anything they do it with the bias toward the whites’ wishes, which are generally unfair to the local non-whites. As I have indicated, I am unfamiliar with this site or the commentators but I am interested in continuing some dialogue and taking some action. If anyone wishes further contact, my email is: paul@wallpe.net . This issue has already been addressed–ahem, responded to–by CRC with removal of a sitting wall and placement of a public restroom. I do hope that you read more than the initial blog post, as there was a fruitful discussion that took place through the comments. I was not being naive when I reported that someone was doing something about the problems in Ziegler Park; in fact, I was being respectful of all users and potential users of the park. Race plays a role in nearly every level of progress or regress in our city, particularly in Over-the-Rhine. Let’s be clear about a few things. First, I am aware of your longstanding efforts to establish a urinal in Goetz Alley, as I heard about it from an area business owner. I am sorry to hear about the policeman destroying the urinal that you installed. However, from all accounts I’ve heard, it wasn’t permissible under city code. Someone can’t simply erect a structure in the public right-of-way without approval. That includes a fence, park bench, urinal, or anything else. It is also subject to a vote by the neighborhood council. So, your proactive approach is/was admirable. Your disregard for procedure was not. Second, I am more than willing to get together to discuss solutions to problems related to the alley. There are many different facets to the issues at Ziegler Park: drug trafficking, prostitution, litter, public urination, etc. So, a larger discussion about the matters would hopefully consider multiple issues, not just “the low-income black people”. Part of the issues lie with the operators of the housing units nearby, for instance. I know that Mercy has recently gotten out of the provision of low-income housing. I do not know who has taken over their former properties. Third, I do not agree with the approach of filing suit against the city, but I wouldn’t expect to agree with someone on all points. Maintenance of alleys CAN be within the responsibilities of Downtown Cincinnati, Inc. and their ambassadors. Instead of shaking a fist at a city that has aging infrastructure built for 500K people, where a little more than 300K people live, a more pragmatic approach that considers multiple stakeholders and ***resources*** seems to make more sense. I look forward to a fruitful discussion in the future. 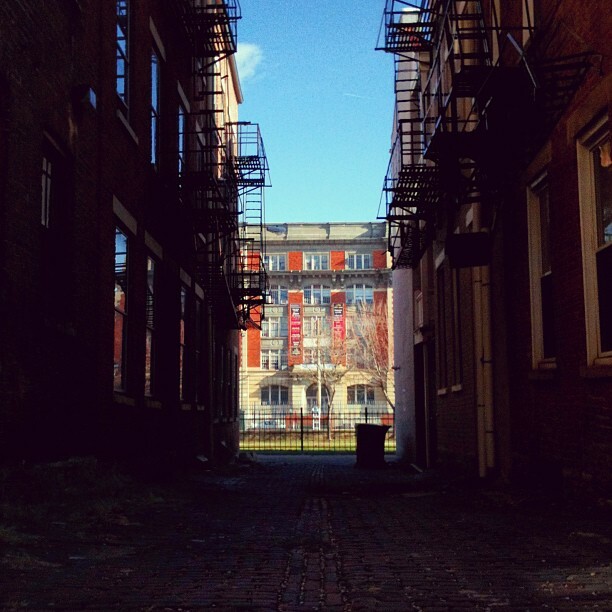 In the meantime, Spring in Our Steps in committed to building a positive network of stairways and alleys throughout OTR and Mt. Auburn, which will include Goetz Alley in its entirety. I am working on a collaborative Adopt-a-Spot that includes tenants, businesses, and building owners all along its path. Sometimes, it comes down to stakeholders holding other stakeholders accountable. Where is: ” I do hope that you read more than the initial blog post, as there was a fruitful discussion that took place through the comments. “? This entry was posted on May 15, 2013 by C. Huelsman in Alleys and tagged alleys, bland alley, goetz alley, over-the-rhine, woodward street, yukon street, ziegler park.